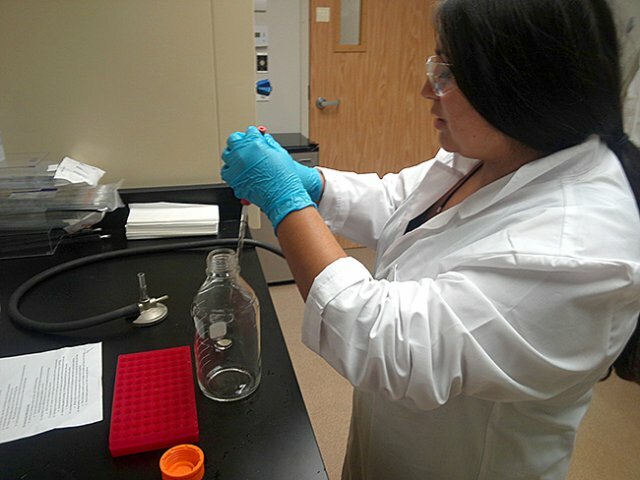 Danielle R. Montoya of Oxnard is working full time on the project with guidance from Theresa Rogers, an assistant professor of biology, in one of the university’s 24 student summer research projects. (THOUSAND OAKS, Calif. – July 11, 2014) A California Lutheran University senior is testing local waterways for the presence of genes that may contribute to antibiotic resistance in bacteria. With funding from a $5,000 Swenson Science Summer Research Fellowship, the biology and global studies major is collecting and analyzing samples from the Hill Canyon Wastewater Treatment Plant, which makes wastewater suitable for reuse in Thousand Oaks. For comparison, she is also testing water both upstream from the plant and downstream from it and nearby wetlands, which remove additional contaminants. She wants to determine whether there is an increase in the level of genes that confer antibiotic resistance after water passes through the plant. Resistance to antibiotics used to treat bacterial infections has become a global problem. While progress has been made in abating the overuse of antibiotics clinically, their presence in the environment is a growing concern. Traces of antibiotics used in medicine and agriculture as well as bacteria encoding genes that confer antibiotic resistance end up in wastewater systems, and it is suspected that wastewater treatment plants may play a role in amplifying and introducing these genes resulting from human activity into the environment. Most studies of antibiotic resistance in treatment plants have relied on culturing bacteria, which may underestimate levels of antibiotic-resistant bacteria because only about 1 percent of bacteria can be cultured in the laboratory. Montoya is analyzing bacterial DNA extracted from the water samples to better measure levels of genes that confer antibiotic resistance. A variety of other summer research projects funded by more than $110,000 in grants are also in progress. Marina Alvarez, a global studies and Spanish major from West Los Angeles, is researching how creating street art has strengthened Latinas’ self-identities through a Pearson Scholars Summer Program Fellowship for Leadership and Engagement in a Global Society. Summer Undergraduate Research Fellowship recipient Chelsea Feller, a psychology major from Simi Valley, is asking students with high-functioning autism about their feelings toward college. Trevor Hougen, a biochemistry and molecular biology major from San Diego who received a John Stauffer Research Fellowship in the Chemical Sciences, is determining whether a novel aromatic dye molecule could serve as a fluorescent DNA marker without causing cells to die as other molecules do. Nickel Revie, a computer science major from Thousand Oaks who received a Darling Summer Research Fellowship for Applied Scientific Computing, will program a robot to search for and rescue another robot he programmed to wander around an environment.